Referred to Ascent by a psychiatric facility after she had almost taken her life, was diagnosed with depression and bipolar disorder. Courtney was living with her brother and his girlfriend because her mother had passed away in a car accident seven years earlier. Her brother and his girlfriend were emotionally abusive, calling Courtney names and telling her she would never amount to anything. She was cutting herself, smoking marijuana, and abusing prescription medication. Courtney was also suspended several times for fighting with students and teachers. When she began working with Ascent, Courtney was very transparent about her past and the struggles that she faced. When she saw her needs written down during the initial Child and Family Team Meeting (CFT), Courtney cried and said, "That's me!" She worked with a Therapist and a Peer Support Specialist. Her supportive boyfriend's family became like her own family, and she felt very loved by them. Coutney's depression decreased dramatically, and she no longer smoked marijuana or abused prescription drugs. Instead, she began to feel optimistic about her future and said she felt happier than she had felt in a long time. 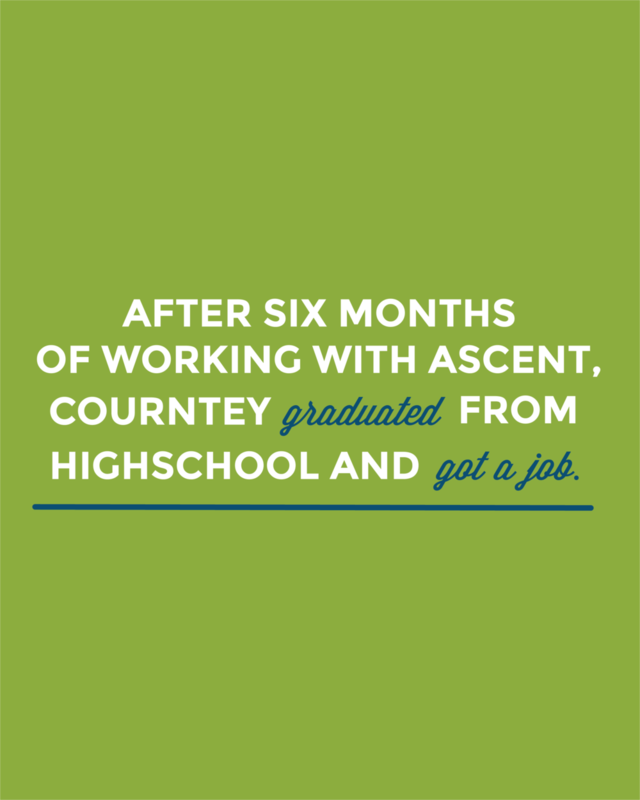 After six months of working with Ascent, Courtney graduated from high school and got a job. She made plans to go to a local college and wants to work in the medical field.